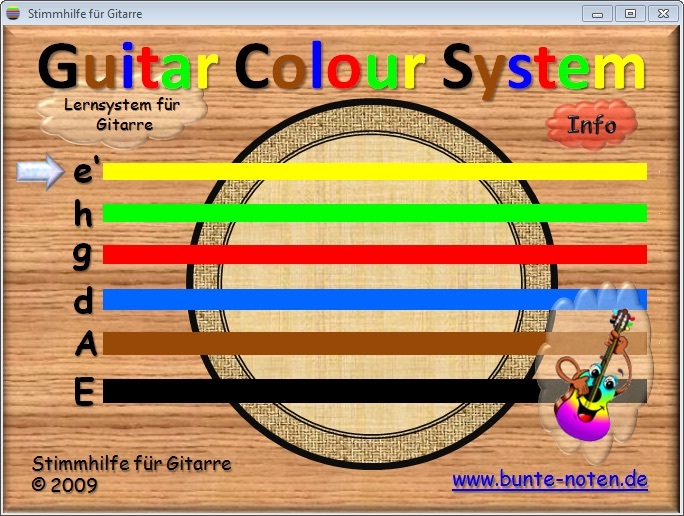 Click on the coloured circles (guitar strings)! For beginners tuning the guitar isn't always that easy. If you don't know the notes traditional guitar tuners can be very complicated. Guitar Colour System® is our easy solution for this problem. "While the sun is shining bright and yellow I take a walk across a green field. I spot a red ball and kick it into the blue sky. The ball bounces back onto small pile of brown sand and rolls down into a black hole in the ground." This story is easy to memorize. Our app is able to show you if string and color match. When your string isn't anywhere near to being in tune our app will show you in which direction to turn for the right pitch. We wish you a lot of fun and success while learning to play the guitar and hope with our app you'll always stay in tune! Learn how to tune your guitar by ear. Extract the zip file and open "Stimmhilfe für Gitarr.exe" (guitar tuner). No installation required. Download zip file (5.5 MB) free! 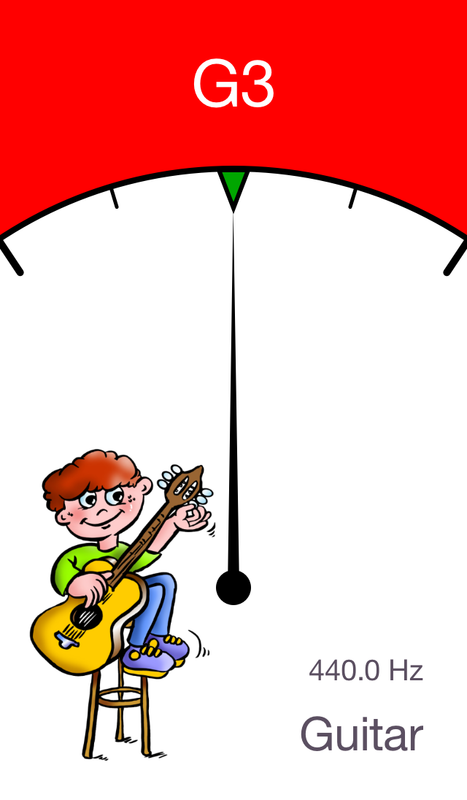 After you have tuned your guitar using the online guitar tuner you can check your tuning once again. It is best to use the 5th fret method - a method of tuning that every beginner should be familiar with. It's not the ultimate way of tuning but okay for beginners. If you play a string with your finger placed on the 5th fret the pitch matches that of the open string above. The only exception is the 3rd string (G-red): you need to play the 4th fret. Start off by playing the 6th string with your finger placed on the 5th fret to tune the open A string. Continue by playing the 5th fret of the A string to tune the higher open string above (blue). Keep on doing this until you have reached the highest string. The thinner the string the higher the pitch. The thicker the string the lower the pitch. The more you tighten the string the more you raise the pitch. The more you loosen the string the more you lower the pitch. The shorter the string the higher the pitch. The longer the string the lower the pitch.